Kayaking on an India river is perhaps the most thrilling experience that anyone can ask for! While you must have always thought of it as an exotic water sport - we are here you to take you for a wilderness ride on a Kayak. During this trip, you will get to sail and cover a total distance of 28 km on a kayak. From one side of the Palimar Dam where the water of Arabian Sea gushes into the Shambhavi River in Karnataka, you'll sail up to the other end of the dam where camps will be set up. Surrounded by the Western Ghats, the camping site is amidst nature, by the banks of the river. Once the dam gets narrow and you slowly enter the river, you'll realize that this place is nature's best kept secret and it's one of those virgin destinations of South India that aren't explored by many. 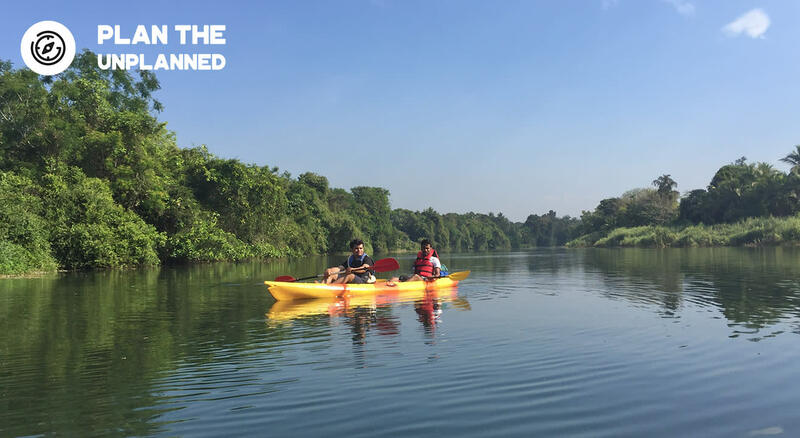 The beautiful landscape can only be explored through the waterway and kayaking here would be the most adventurous ride! Anything that's not included in the inclusions above. Additional charges would be deducted(based on from where you booked) if you cancel the trek at any given date(along with the scenario described above), as payment gateway/event listing partner charges. For all the above choices, you can transfer your tickets to your friends. We would be more than happy to have them on board and you could save your hard earned money. Plan The Unplanned is a travel based start-up for adventure junkies and people who are always ready to pack their bags and hit the road. PTU started its journey in 2016, and has organized several treks in South India like Kodachadri and Tadiandamol, as well as places like Kheerganga up North. The team consists of spirited, enthusiastic youngsters who aim to get more people to explore the outdoors.